A superb quality table top cabinet, made in Burr Walnut with Sycamore with Ebony and Boxwood inlay, giving this cabinet a striking appearance. The internal drawers made in Mahogany and retaining the original knob handles. 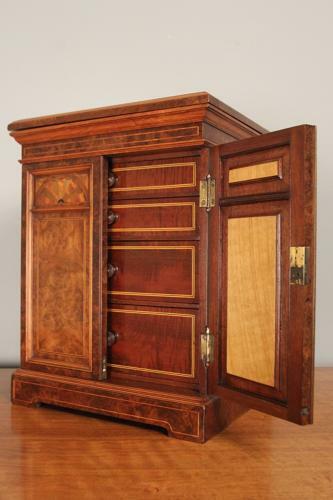 Having a panelled back, lift up lid which opens to reveal a velvet lined interior. The internal bottom drawer containing a leather writing slope, pen tray. The cabinet stamped by London makers J.D. Roberts.